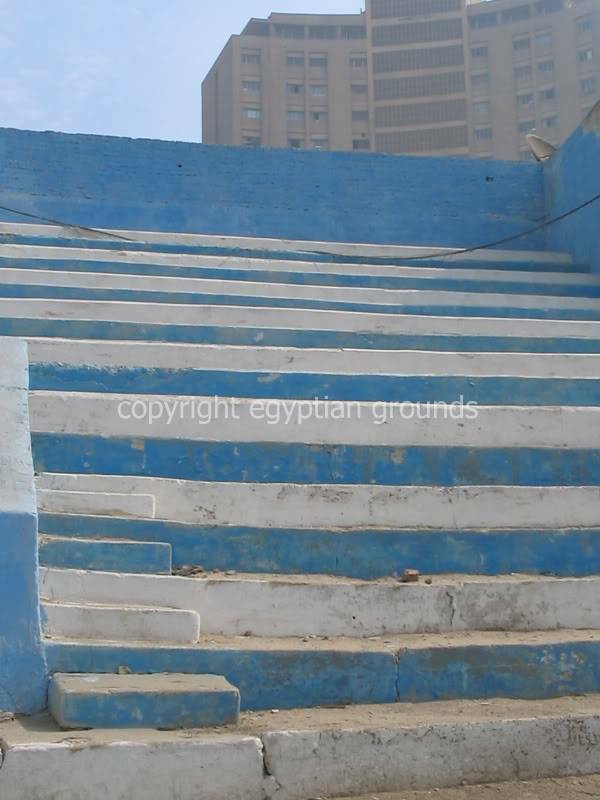 It is my intention to contribute to this board with a pictorial series of the Egyptian footballing landscape. Egypt is the cradle of ancient civilization, the museum of history, and the melting pot for all the greatest civilizations over centuries. On Egypt’s soil, Pharaonic, Greek, Roman, Coptic and Islamic civilizations flourished, leaving behind a heritage that dates back to more than 5000 years. Every inch of its soil tells a story or a legend that has long puzzled and marvelled scientists and intellectuals. Everyday it unravels treasures and secrets of human advancement in many fields that range from astronomy to mummification. On this time-honoured land, arts and sciences have flourished and religions have emerged. So has the art of football. The game of ball, it is commonly known, dates back to long before the history of most nations on planet earth; to the heart of civilisation and the homeland of the Pharaohs. But as the geography of the world took on more ordered form, and the boundaries defining nations were mapped out in bold, that haphazard kicking around of a ball adopted its own structured modus operandi. 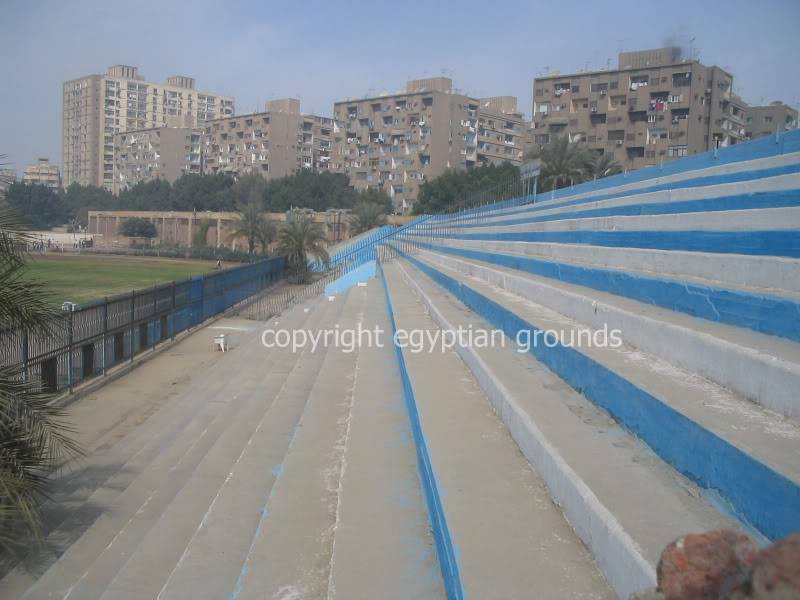 Generally speaking, Egyptian grounds are like pyramids and mosques, barring the odd fine exception. If you’ve seen one, you have seen them all. There’s the inevitable and dreaded athletics tracks, a semi-covered main stand running three quarters of the pitch, open stands sweeping round the corners only to meat uncovered seating opposite main stand. 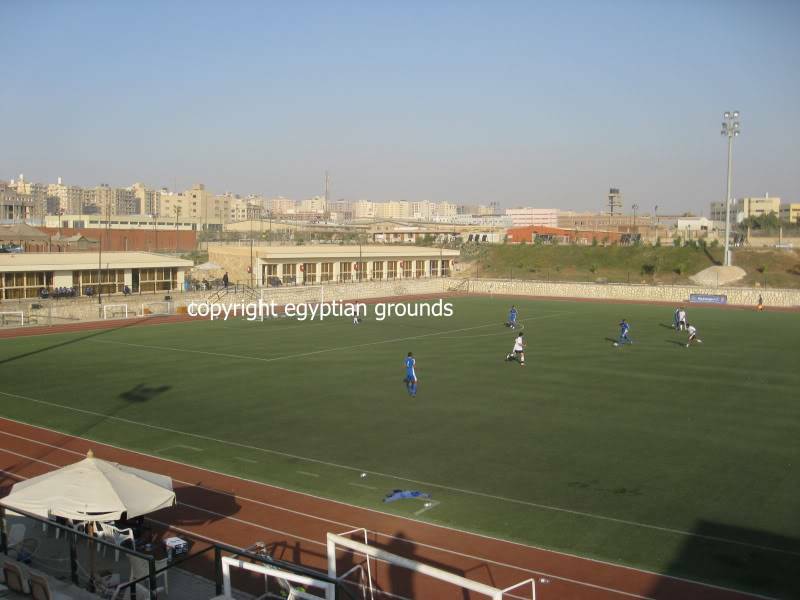 The main reason for the oval ground landscape in Egypt is that the vast majority of football clubs are actually omni sports clubs, with football being only one of the activities. The biggest club in the country, Al Ahly, meaning ‘National’ were founded in 1907 and hold nineteen sporting branches, including basketball, volleyball, swimming, hockey and squash. Arch rivals Zamalek started out as the Mukhtalat Athletics club in 1911 with an archer still visible in its emblem. 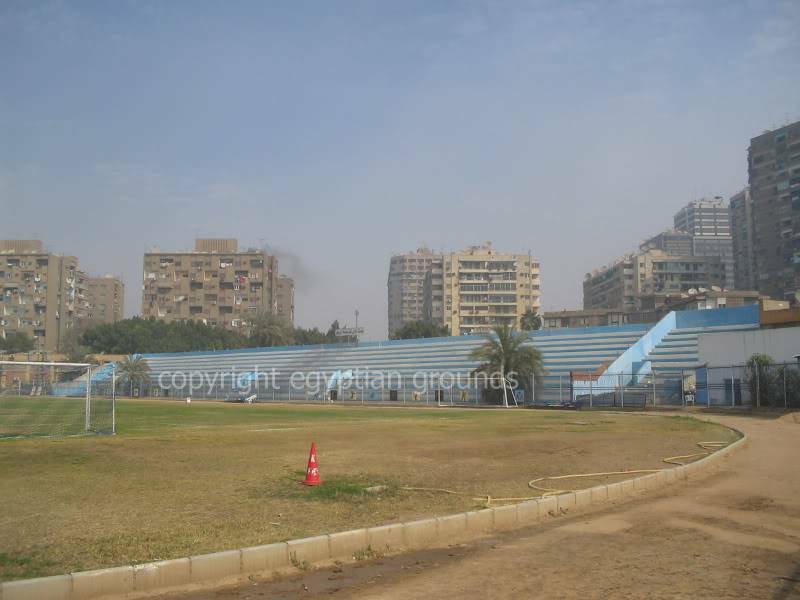 In Cairo the majority of grounds are set in huge parks, some of them dwarfing any Olympic village. The severe safety regulations are almost disencouraging, turning grounds into almost unassailable fortresses. Only members are allowed access and any request to take photographs is met with sheer disbelief and instinctively denied by default to start with. It’s like asking permission to enter a mosque star naked. These pictorial series result from persistency and determination. It’s been close to a mirage to eventually captured Egyptian grounds on camera. We embark on our Egyptian Fields of Dreams tour in Cairo. Al Qahira is the capital of the Arab Republic of Egypt and is the largest city in Africa. A bird’s eye view of the city would include a skyline that is highlighted with lofty minarets and a large number of high-rising, gigantic floodlights. 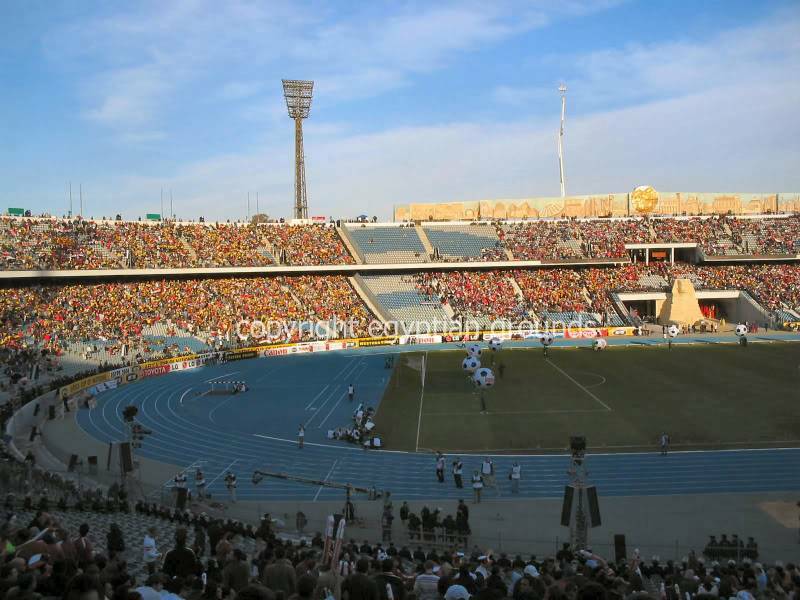 Opened in 1958, the Cairo International Stadium has played host to many big matches over the years, including the final of the 1986 African Nations Cup, when Egypt beat Cameroon on penalties and the Fifa under-17 World Championship in 1997. 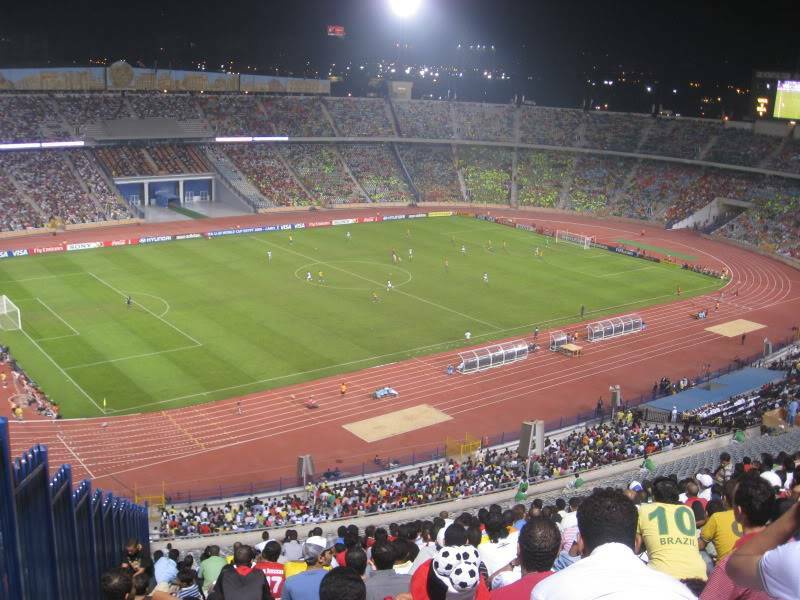 Today the gigantic stadium hosts the majority of home matches of powerhouses Al Ahly and Zamalek, together with the representative matches of the national team. 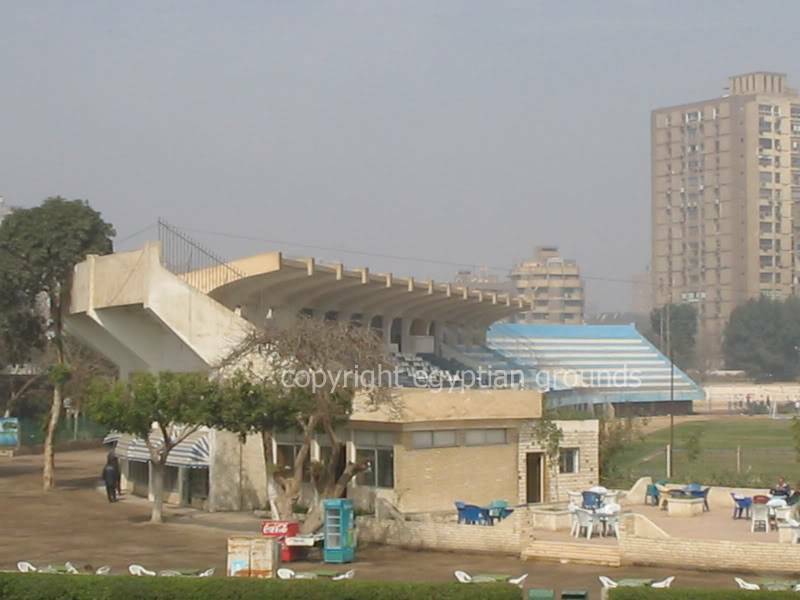 The stadium is located on Al-Istad Al-Bahary street in the Nasr City District in the south-east of the capital and set in a gigantic park, its majestic floodlights confusingly competing with those of the adjacent training ground, the national hockey stadium, a tennis stadium and a swimming stadium. 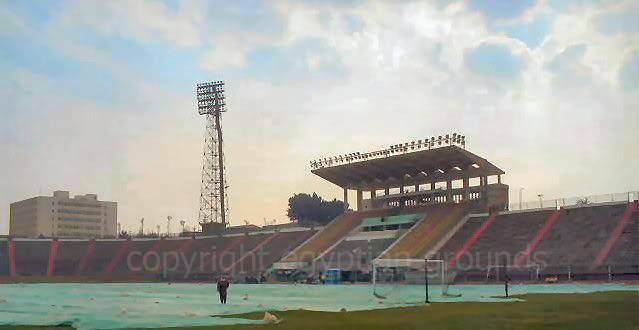 Floodlight heaven in Cairo. Its contours seem secluded since almost the entire ground is set in an excavated bowl, with only part of the second tier above ground level. Its official size is 74,100 but at one stage during the first round of the African Nations Cup in 2006, 86,000 are said to have been present for the Egypt vs Morocco clash, with thousands crashing the gates or paying ‘baksheesh’ at the turnstiles, gaining almost free access leaving spectators with valid tickets locked out. 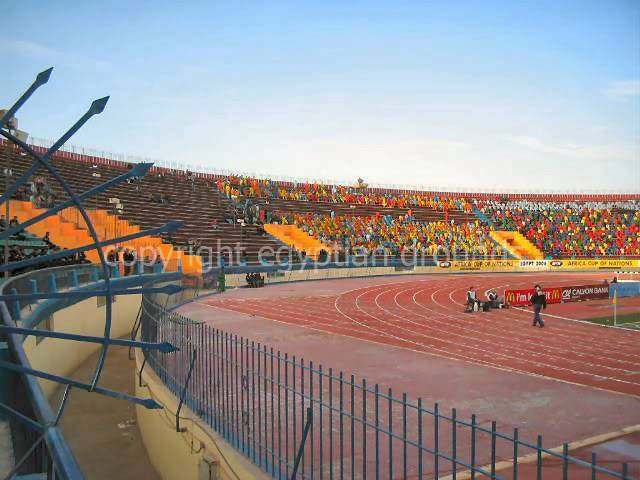 Work had been going on day and night for 18 months until November 2005 to prepare the majestic bowl for the African Cup of Nations at a cost of approximately € 20,000.000, money spent on refurbishing the stands, the provision of vip facilities, creating a mouth watering blue athletics track, electronic gates, in house mosques, an advanced tannoy system, permanent tv and crowd supervision camera’s, etc. 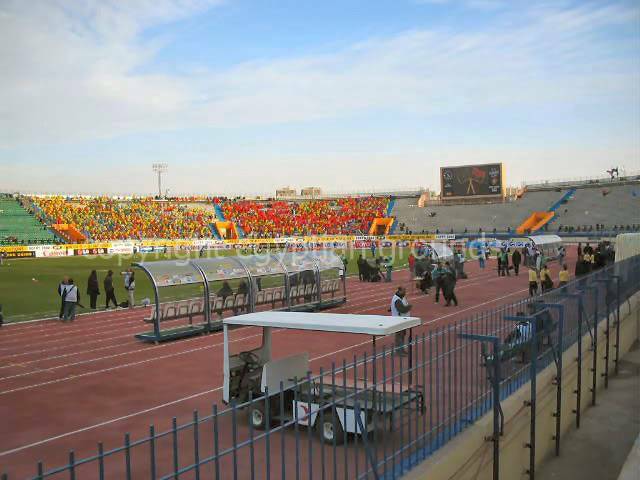 For the opening match against Libya 32,000 police were present to mark the route for President Mubarrak’s visit to the ground with the gates locked at 4pm to enable empty streets for his arrival, marking the colorful and emotional opening ceremony and the 7 pm kick-off . The crowd were trapped like rats in a cage since the gates were kept locked ‘for safety reasons’. 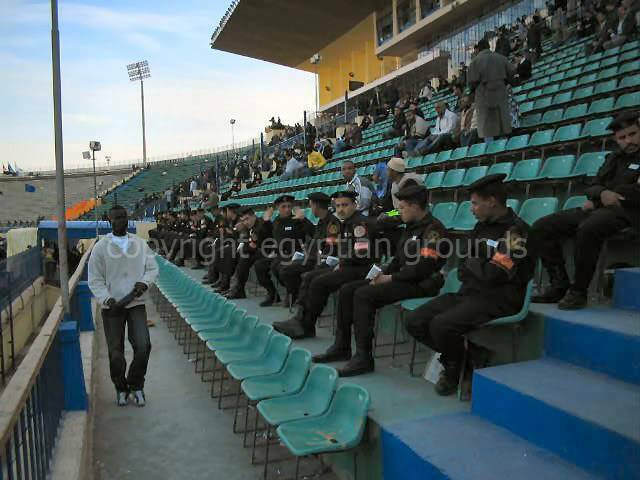 The stairways were blocked with spectators, stewards, police, the army and the stadium security all seemingly operating with their own agenda, void of sensible directives of crowd control. The stadium bathes in an attractive wavy mixture of mild blue and greyish seats, with the much-debated athletics tracks blending in splendidly until recently. Despite the distant to the pitch the stands provide for an unobstructed and graceful view, the partisan crowd making for a carnavalesque rather than a hostile atmosphere. At night the Cairo International Stadium transforms from a vivid and bright girl to a sophisticated grand lady, the slender floodlights providing for a romantic, moody and serene scene. The deafening sound gone by the wind, the evening creates a tranquil setting. 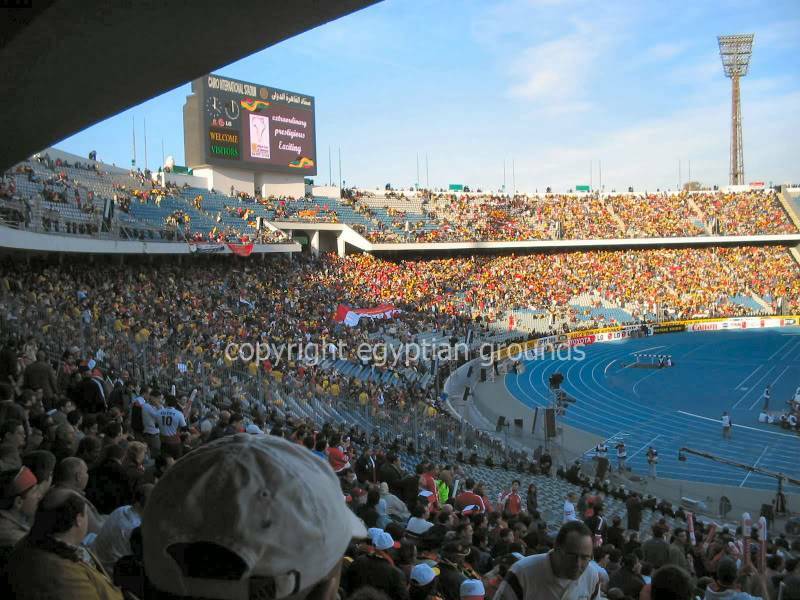 The Cairo International Stadium is on par with any other international modern football venue and comfortably competes with any other major ground anywhere in the world, fit to stage any major sporting event. 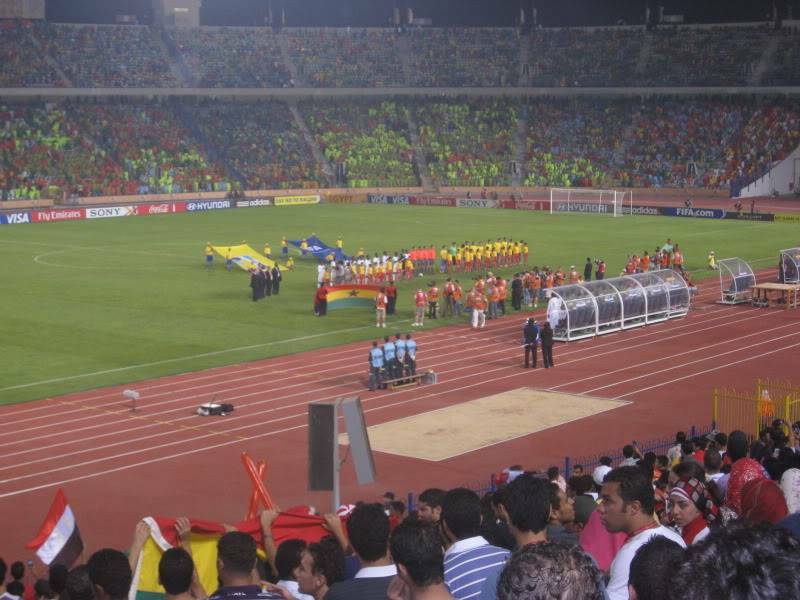 Cairo Stadium has been refurbished to stage the FIFA World Cup U-20 in 2009. Unfortunately the distinguished blue running tracks made way for the all too familiar tartan brownish red. Thank you for this very stylish and well-written piece, anticipating the rest of the stadiums! It's funny, when the blue track was put in place I thought it was so much harder on the eyes than the red tartan. After re-installation of the red (apparently, many people had a similar opinion to mine) I kind of have a nostalgic crush on the blue one now. Never satisfied. 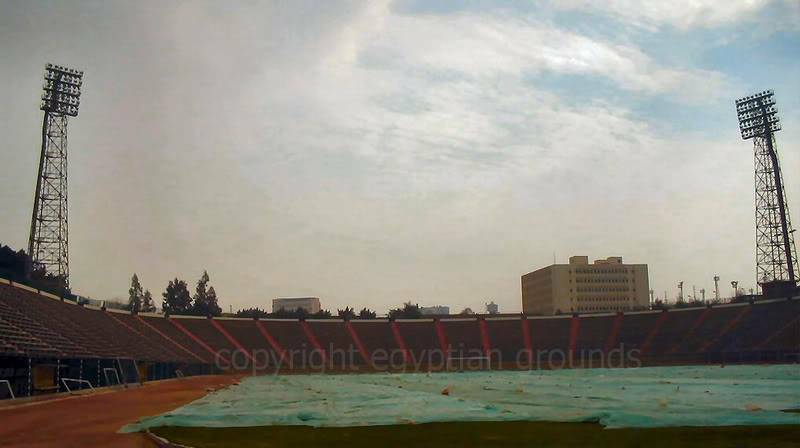 Some seven miles up the road from Cairo International Stadium, heading for Cairo International Airport, we hit the Cairo Military Academy Stadium at the far end of Orouba Street in the north-eastern Heliopolis district of Cairo. The top tier from the nearby cake walking spaghetti-junction provides a spectacular birds eye view from the ground if not obstructed by the occasional overtaking taxi or pick-up truck. Locally known as Estad El Koleya El Harbeya it holds approx 30,000 and was built in 1989 for the use of military teams and students at the military academy. 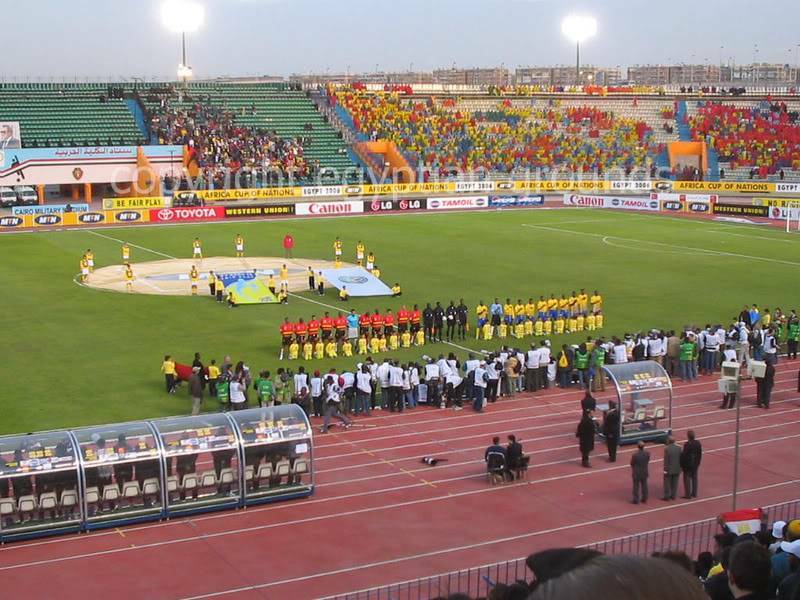 The stadium hosted a plethora of matches for the African Cup of Nations in 2006, including the infamous encounter between Drogba’s Ivory Coast and Eto’o’s Cameroon that ended in an almost unprecedented penalty series. 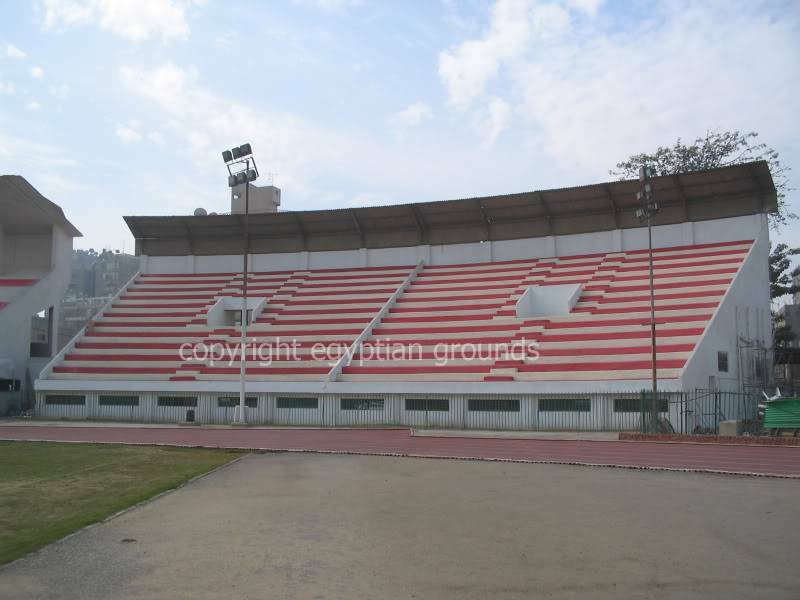 The ground accommodated home games of Al Ahly and Zamalek during the refurbishing of the Cairo International Stadium and occasionally still serves to stage matches of the old foes. 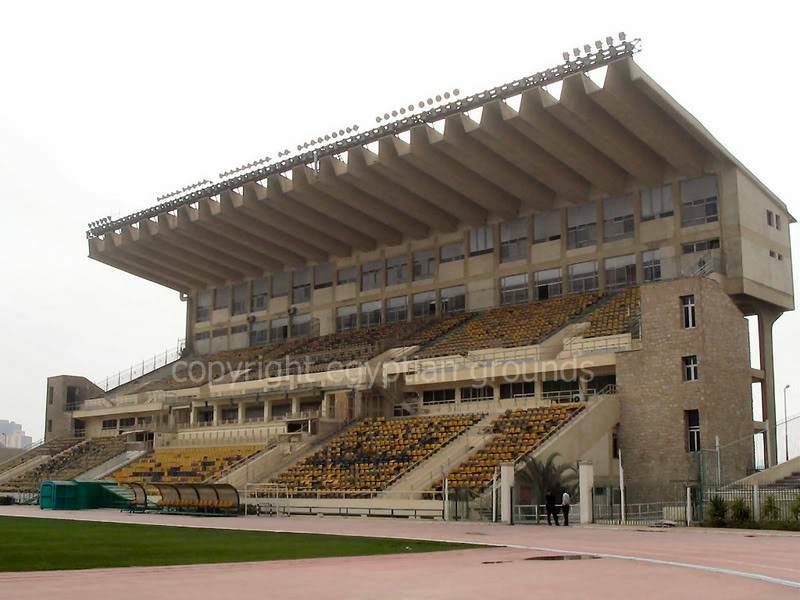 Unfortunately the stadium, set in the mind boggling huge premises of the buzzing metropolis’ military academy, conjures up visions of a soulless and uninviting concrete bowl with only a small roof extension serving as a cover for the main stand. On demand, during matches rent-a-crowd military cadets serve as ground-fillers in addition to the sparse paying spectators for football matches. Irrespective of the stadium name one encounters safety measures that baffle the eye and common sense. TV gantries are set up on escape routes, obstructing safe movement within the ground and army and security people seem more concerned about their own free pathways and view than those of paying visitors. With morbid precision beyond belief people are being ordered by security forces to literally climb over spectators who in their turn block the view from the stairways. Fences and security people are here to cage you in like animals. The overwhelming presence of police, army and security forces make for an intimidating and extremely inhospitable atmosphere. Any sheer incompetent and responsible body in charge should be obliged to take knowledge of the evaluation of the 1989 Hillsborough disaster in Sheffield, England, causing the death of almost a hundred hapless souls. Only a stampeding crowd with resulting casualties may knock some sense into the stadium’s irresponsible bodies. Or rather ignite to have the ditch that surrounds the pitch filled with piranha’s and crocodiles by senseless authorities to create an even more hostile decorum. 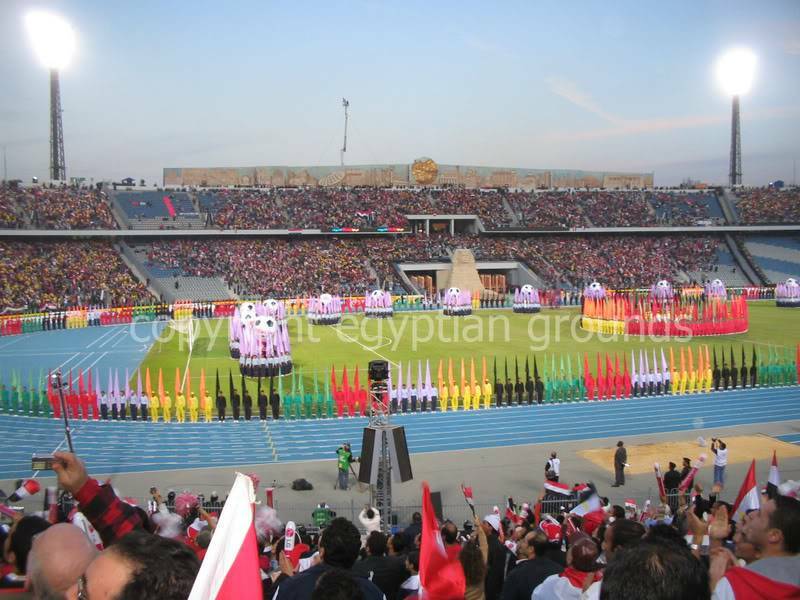 The unimaginative Cairo Military Academy Stadium may serve as a showpiece to demonstrate regime power, it’s certainly doesn’t qualify as a display of the proverbial unrivalled Egyptian hospitality. 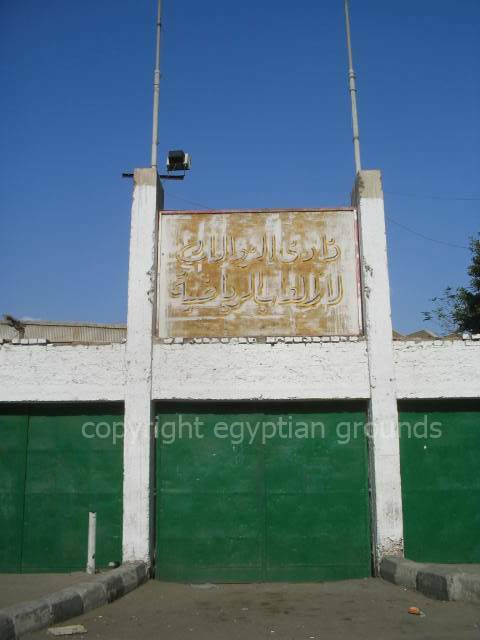 On the immense scale of Heliopolis in north-west Cairo, El Shams Club is only a stone throne away from Estad El Koleya El Harbeya; or as the birds fly, only a few flapping of the wings. 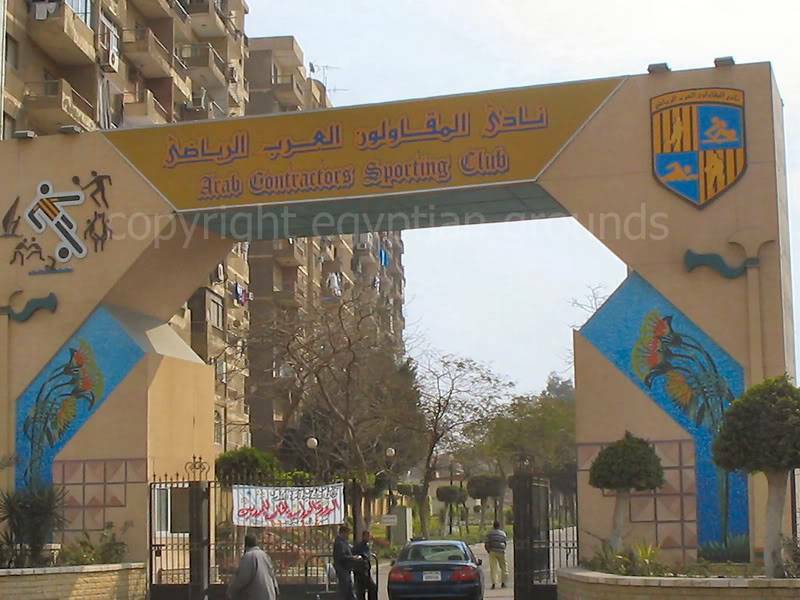 The doorman at El Shams Club is the impersonation of the Greek mythological creature Cerberus and the emblematic omen of any doorman at any Egyptian ground or stadium whose instructions not to allow anyone in seem default. The severe safety regulations are almost discouraging, turning grounds into almost unassailable fortresses. Only members are allowed access and any request to take photographs is met with sheer disbelief and instinctively denied. It feels like asking permission to enter a mosque star naked. Eventually capturing Egyptian grounds on camera is a result of sheer persistence, determination and bluffing a way past a chain of security people. Metaphorically speaking, Egyptian grounds are like pyramids and mosques. If you’ve seen one, you have seen the majority, barring the odd fine exception. Once inside a stadium one eyes the inevitable and dreaded athletics tracks, a semi-covered main stand running three quarters of the pitch and open stands sweeping round the corners only to meet uncovered seating opposite main stand. 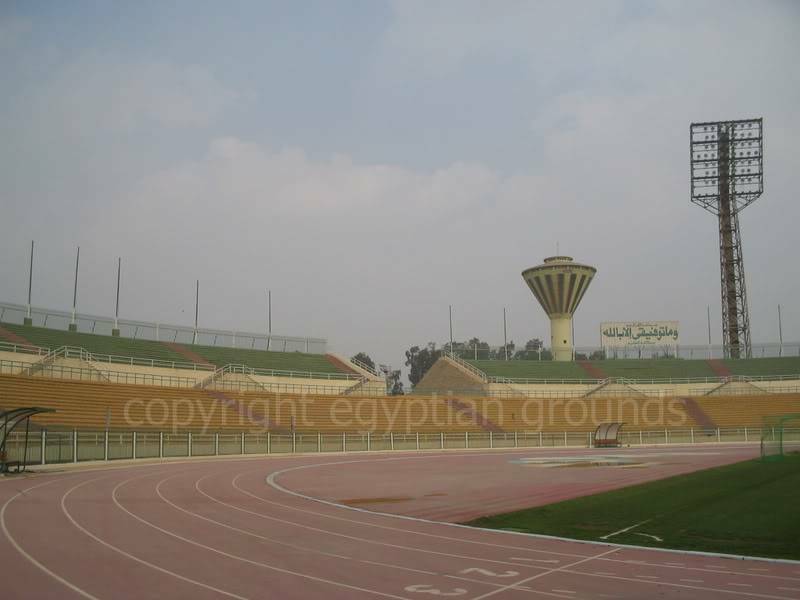 The main reason for the oval ground landscape in Egypt is that the vast majority of football clubs are actually omni sports clubs, with football being only one of the activities. The archetypal Estad El Shams is no exception by all means. Travelling back from Heliopolis to Nasr City, one miniscule pixel on the map of Cairo in Google Earth, one giant leap for driving mankind, the Osman Ahmed Osman Stadium beckons. This huge ground is named after the holding company of the construction firm Arab Contractors, formerly guised as Moqawiloon. 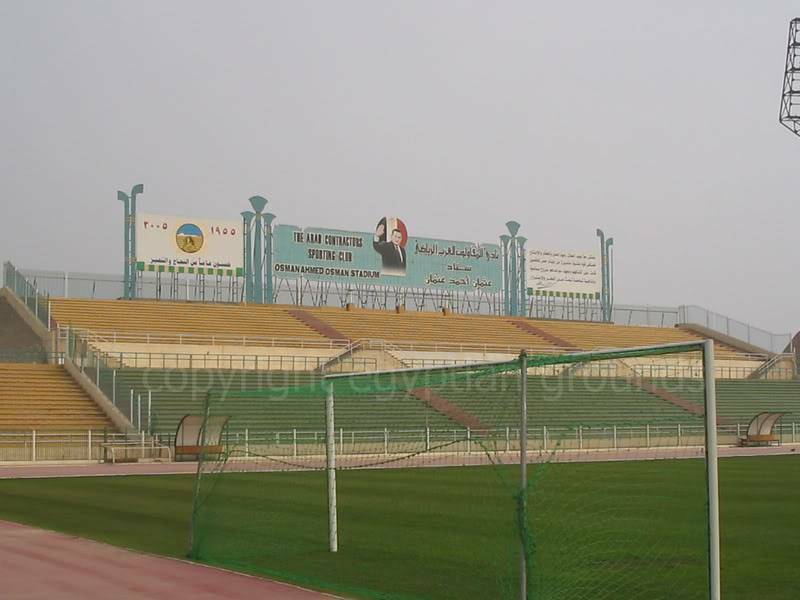 The stadium is located in the south-east of the capital and constructed on top of a hill, locally known as the Green Mountain (El Gabal El Akhdar). It can be spotted from almost anywhere in Cairo with huge floodlights scraping the moon. 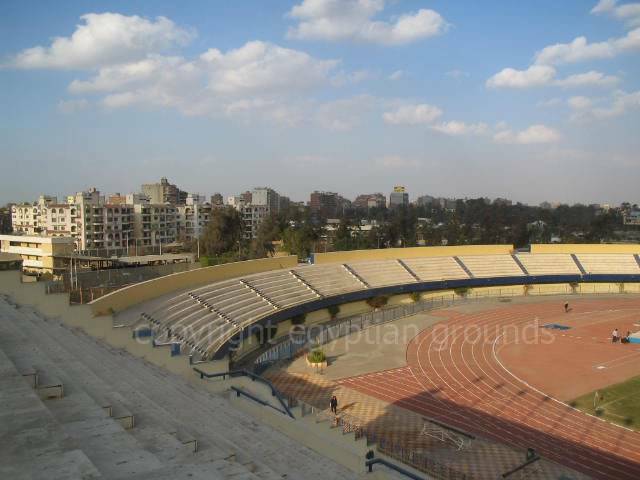 Speaking of El Gabal El Akhdar, capturing the Osman Ahmed Osman Stadium on celluloid is yet another huge mountain to climb. The oval shaped grounds’ unique asset is the yellow ochre and green second tier, divided into sections on top of the lower green and yellow ochre bottom tier, leaving for large open gaps to cause treacherous windy conditions at such heights. The gigantic open and barely covered main stand seems to have alienated itself from its surroundings. Its alleged capacity ranges from 35,000 to 60,000, with 45,000 probably a more accurate figure. 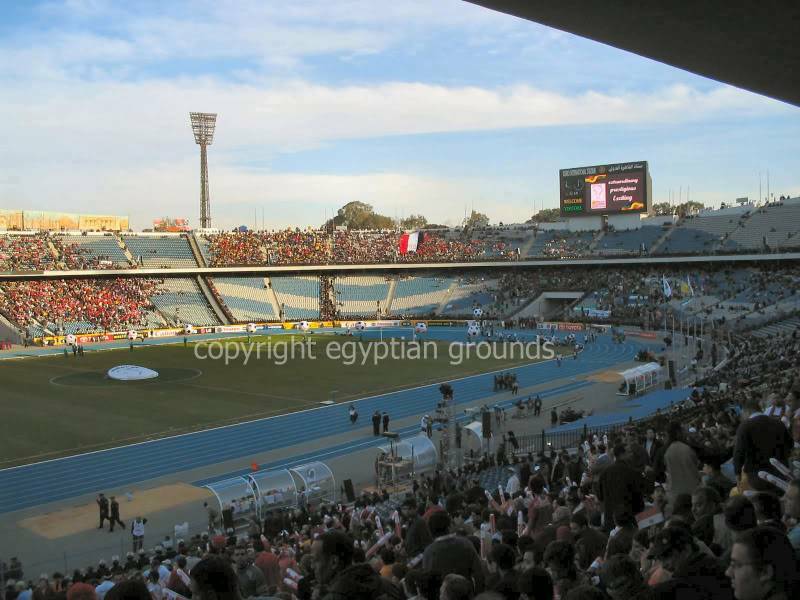 The stadium accommodates four star hotel facilities for the home and away team on top of the main stand, providing for a breathtaking view of the interior of the ground and Cairo’s impressive skyline. 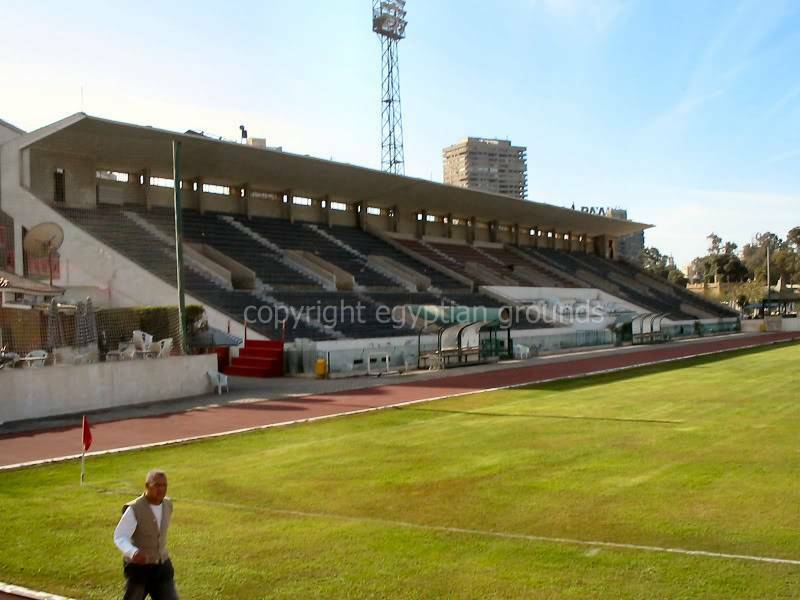 Regardless of its spaciousness and its quaint main stand curiously disjointed from the rest of the ground the Ahmed Osman Ahmed stadium is clearly one of the better venues in Egypt. Brilliant work as usual, thank you. Fetishists who visit Arab Contactor’s stadium for the first time will not only be baffled by its huge floodlights but also stupefied by a set of stunning counterparts further up on the road. It makes one’s heart go ticking anxiously like one approaches the sea and can hear only the thundering sound of rolling waves but not yet see. There’s no other alternative than quicken one’s pace when descending El Gabal El Akhdar only to find oneself running down the street with enticing floodlights in sight, tempting like the sound of luring Sirens from mythology tales. 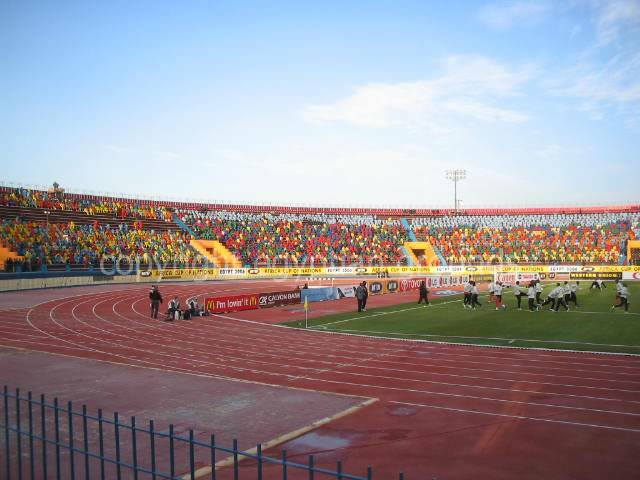 The floodlights are the guardian angels of the Railway Stadium, home to Al Sekka Al Hadid in Nasr City, allegedly the oldest organised football club of Egypt. The informal game of ball had long held its place on the nation's streets and alleyways. The history of Egyptian "football" goes back to 1882, the beginning of British occupation of Egypt, the English being the creators of the structured form of play. Military camps of the occupying forces spread around the Arab region and so too did the game. Given their place as the creators of this structured form of play, apparently the English were keen to spread game around the world. In 1903, the Al Sekka Al Hadid Club formed the first football team, comprised mainly of British and Italian engineers working in the maintenance workshops affiliated to the railway authorities of the time. 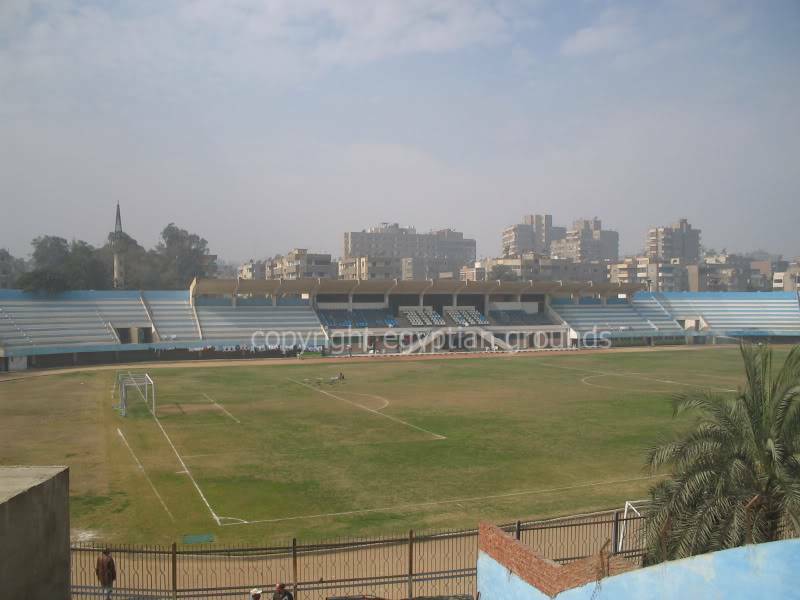 Despite claims that Al-Sekka Al-Hadid is the oldest Egyptian club, Gezira were established by the British in 1882 under the name El-Khedive. The Railway Stadium is another oval affair, the massive floodlights overshadowing open elevated and sweeping stands, holding approximately 30,000, with the home team, dwindling in the doldrums below the Momtaz since the early Nineties, attracting merely a few hundred for their games. 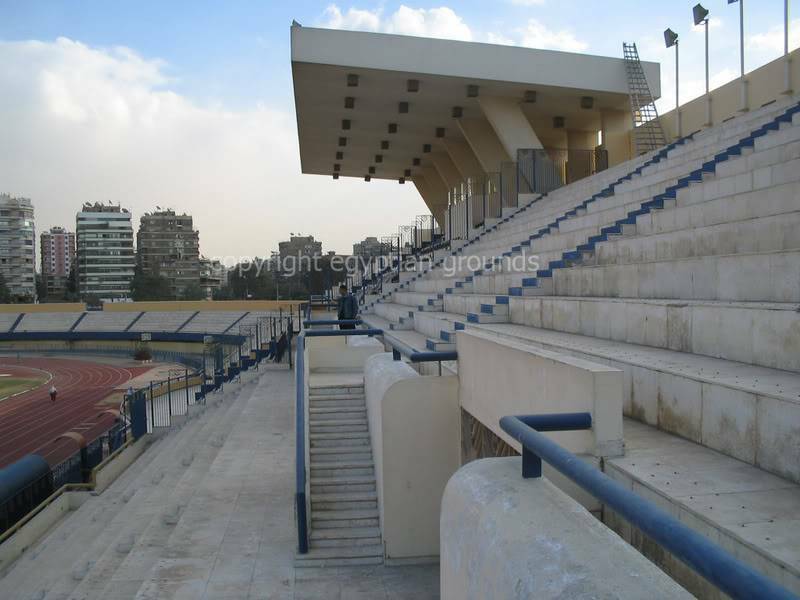 One accesses the ground from the buzzing square in Nasr City that serves as one of the cities traffic aortas to hit a quaint balcony type stand behind the goal, backing on to a swimming pool. From here the floodlights from El Gabal El Akhdar can be spotted. The tantalizing agony of it all. A second access point is a slipway just around the corner leading on to the cinder track even by private car. Once inside the reception of the grounds man is heart warming to they the least. Home sweet home. If Mariska Veres, the lady lead singer of the Dutch pop group Shocking Blue had visited Al Sekka Al Hadid she’d never written ‘Never Marry a Railroad Man’ with which song she and her band men stormed the USA charts back in the flower power days. 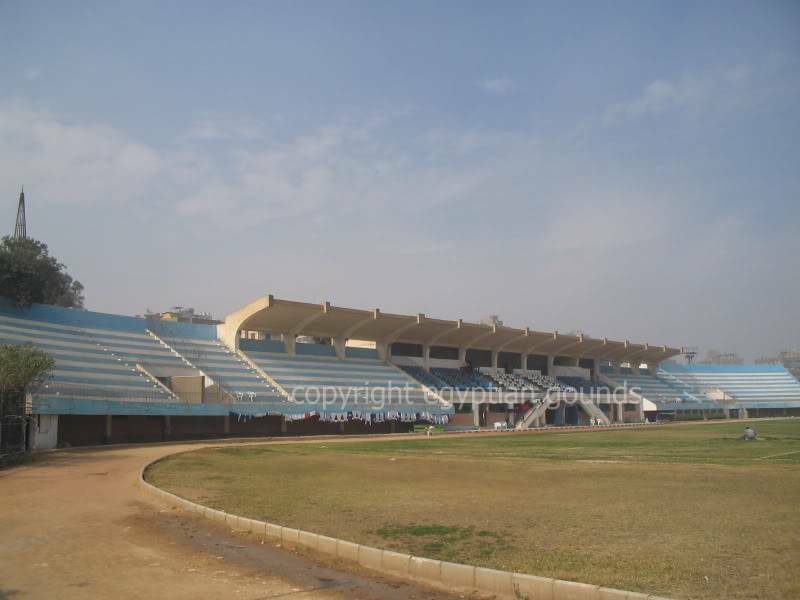 The cute main stand with its high roof, covering just the back seats is the centrepiece of the Railway Stadium. From here seated stands curl around the pitch with respectable distance, separating the audience with iron fences that conjure up visions of the Berlin Wall or its Chinese pendant for that matter. Only athletes with a vaulting pole would manage a pitch invasion from the stands. Al Sekka Al Hadid’s pitch would easily qualify for the sandbox of any long jump contest. Yet, the ground has a pleasant feel to it. One feels home at the oldest club of the country. Man! 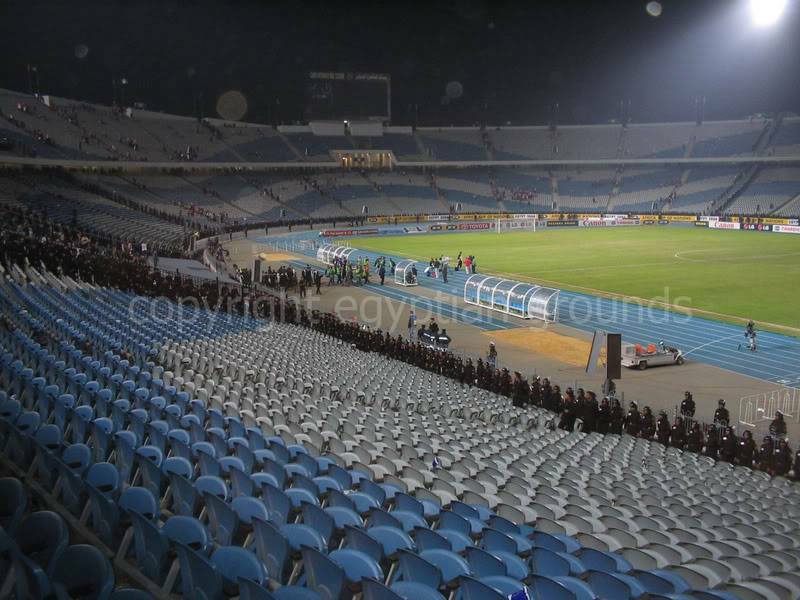 How many stadiums we have in cairo! but few meet the minimum standards. Are there any plans to build a real football stadium? 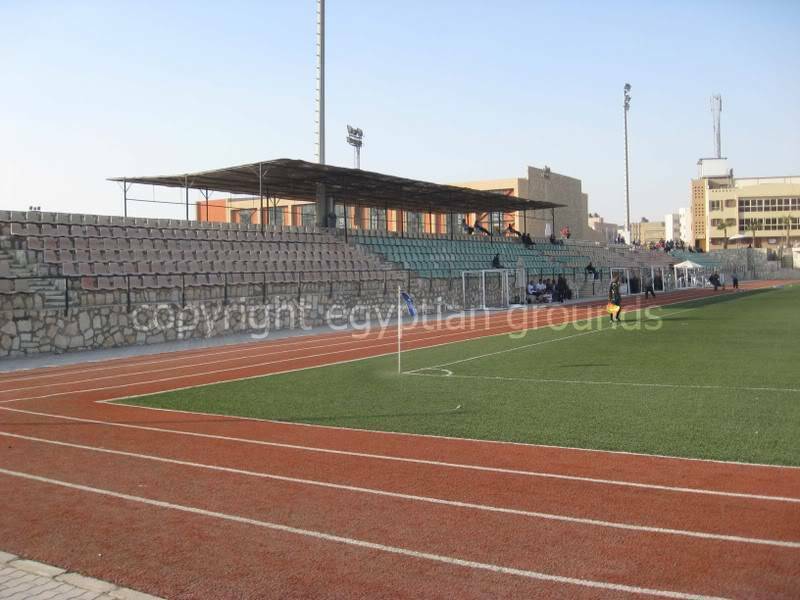 I heard that Wadi Degla's Maged Samy is planing to build such a european-style stadium without tracks. NSNF, any idea where this stadium will be located? And what about Ahly? 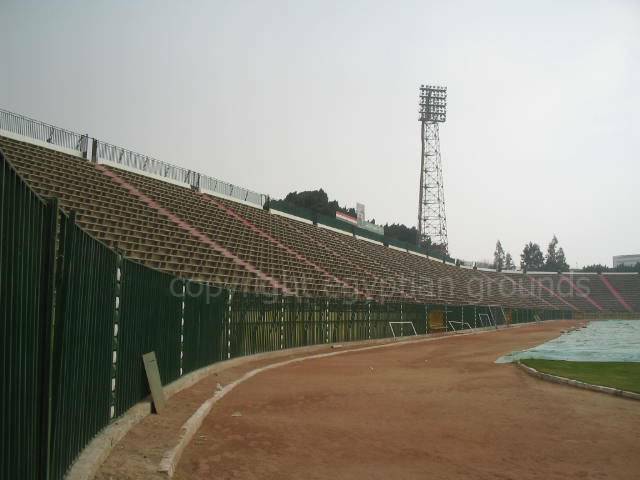 Two Years ago one of my cousins told me that Ahly is considering building their own stadium. Any Development there or just talking? sembon wrote: Man! 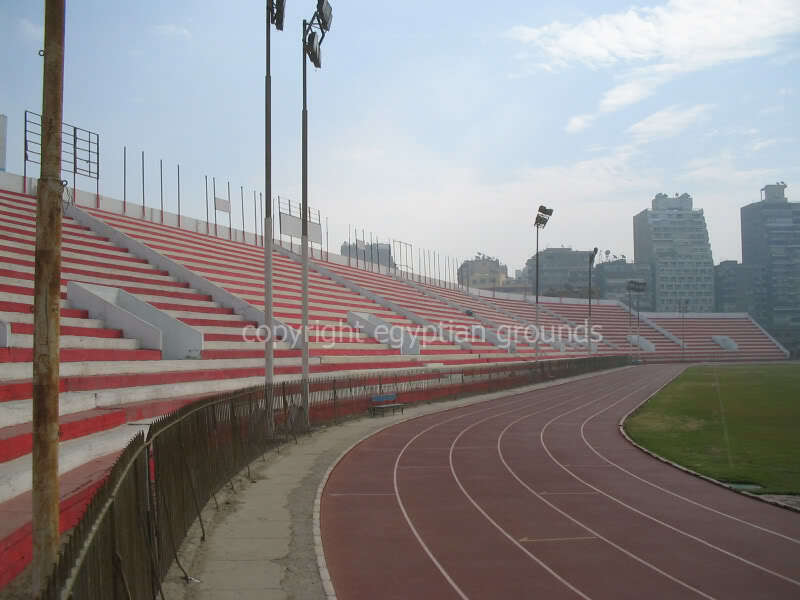 How many stadiums we have in cairo! but few meet the minimum standards. Are there any plans to build a real football stadium? 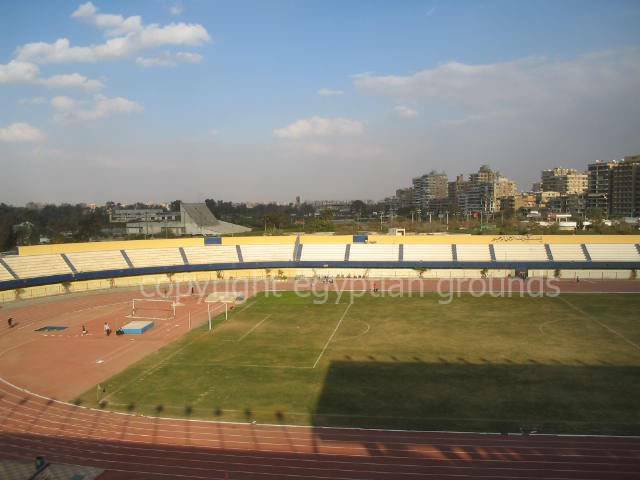 I heard that Wadi Degla's Maged Samy is planing to build such a european-style stadium without tracks. NSNF, any idea where this stadium will be located? My spokeswoman within the club cannot confirm any details. Had Joe Cocker been an Egyptian crooner from days gone by the lump in his throat would have produced the wonderful isle of Zamalek when singing 'Cry Me A River'. Set in the river Nile, Zamalek conjures up visions of the old banlieueus of Paris and the exquisite grandeur of Prague. Peculiarly enough, Zamalek, more specifically the Gezirah district, is the spiritual home of centennial Al Ahly. The origins of Al Ahly coincide with the nation’s uncomfortable feeling of pressure of British occupation of Egypt, the sentiments bundled by Egypt’s patriotic leader, Mustafa Kamel. A charismatic figure, who became instrumental in the birth of the club, initially a semi-political sporting stronghold for the revolutionary establishment much to the chagrin of the occupying body. Irrespective of the British efforts to nullify Al Ahly, the club became the new spirit for Egyptians, the people and the nation, its motto echoing the strong belief to try to achieve the impossible. Allegedly, the club has become a national icon as a club from the people for the people. 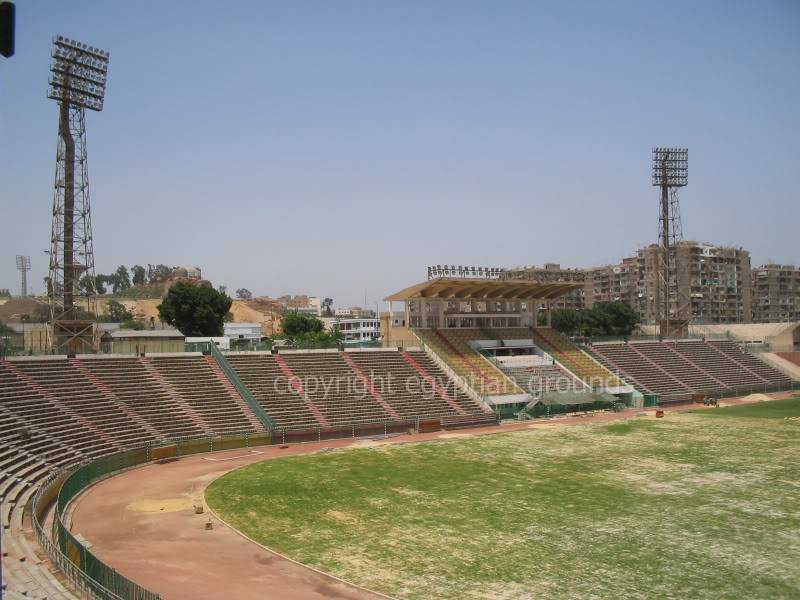 Their original ground is called Mukhtar El Tetsh and only the main stand remains. 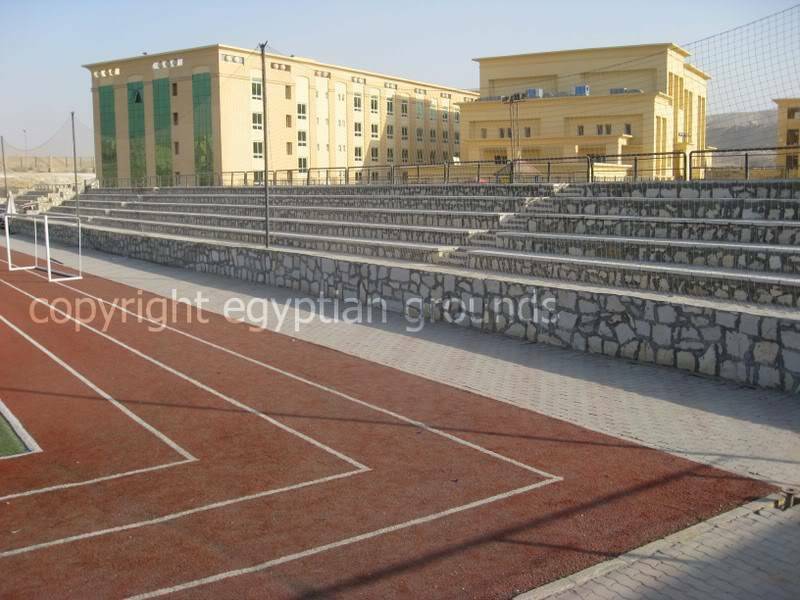 The Mukhtar Al-Tetsh premises today serve as an omni-sports complex. 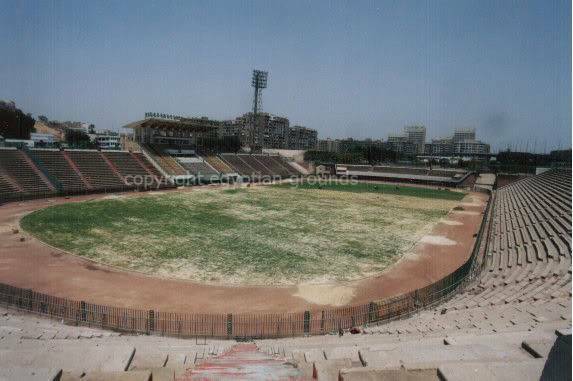 The stadium allegedly held 25,000 people during the days Al Ahly played there. Initially, the guy at the door wouldn't allow any picture to be taken 'because the stand was destined to be demolished'. Did I reply by stating he'd just handed the best motif to have it saved for posterity? I would have thought so. Crossing The Nile westbound from the isle of Zamalek means breaking the sound barrier of yet another Cairo Cacophony. 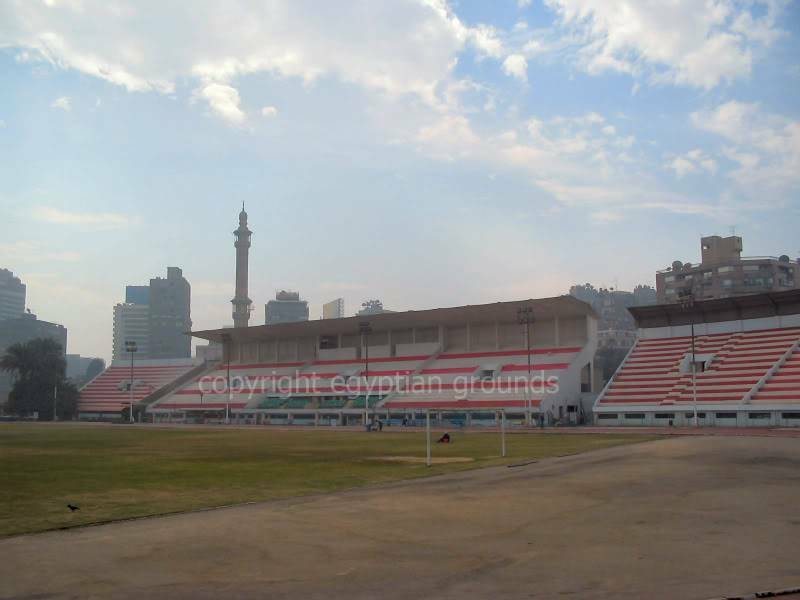 The area of Mohandessin, more precisely the Mit Okba district, saw the rise of omni Zamalek Sporting Club in 1911, allegedly under the guise of Kasr-El Nil, at a time British army teams, college teams, Al Sekka Al Hadeed and Al Ahly dominated the football scene in fascinating Cairo. They became known as the Al Mokhtalat Club until 1941. The ‘Farouk’ stigma would follow, only to be re-branded in the now household name Zamalek in the wake of the 1952 revolution. Irrespective of the name changes, Mohamed Hassan Helmi, who took the ‘Zamora’ nickname from Spanish goalkeeping legend Ricardo Zamora Martinez, will always live in the hearts of Zamelkawy as an iconic synonym for their beloved club. He ran the club’s presidency for three terms in the Sixties, Seventies and Eighties of the previous millennium and is still renowned for his strong leadership abilities, professionalism and innovative skills. It therefore will come as no surprise that the club’s home soil is named after this heroic and charismatic character. 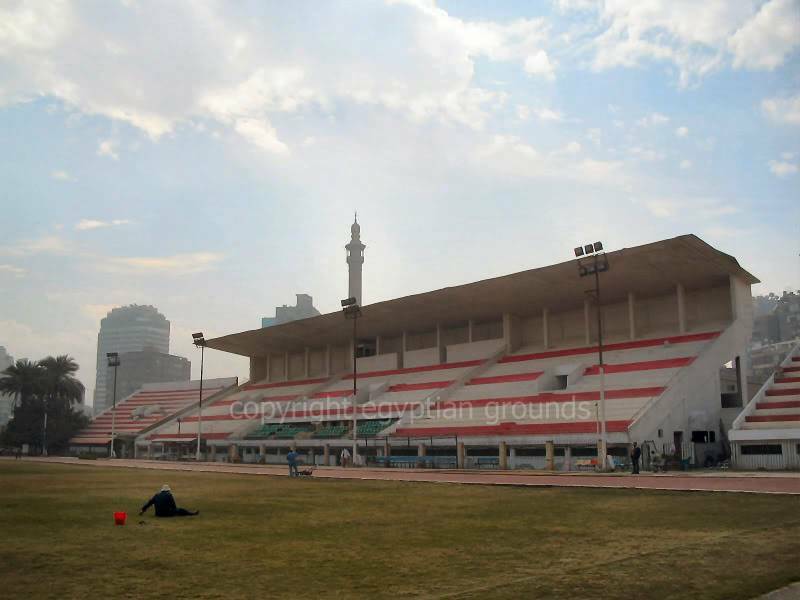 Unfortunately, Zamalek’s cradle, has been bereft of its end stands and floodlights in the course of 2005. In its heydays, the ground would have accommodated at least 30,000 self-acclaimed bohemians and free-thinkers, or maybe even aristocrats. However, what is left is a two-sided venue, meticulously maintained to accommodate athletes and to serve as the club’s office and training facilities. The neat and covered main stand, its colours representing the club’s sartorial saga, is neighboured by two uncovered and smaller look-a-likes. 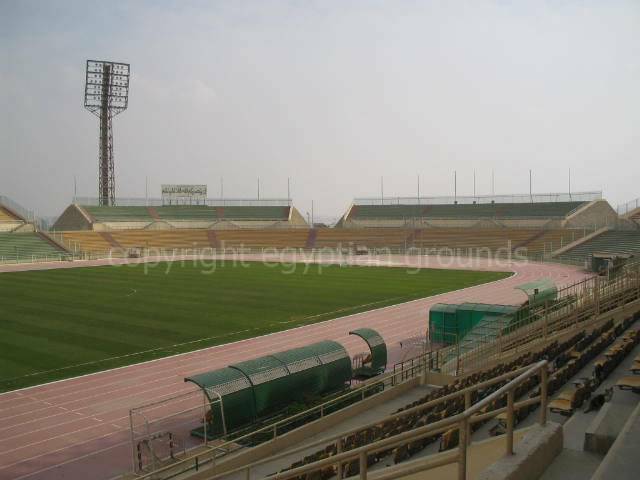 Newly erected tiny floodlights not only obscure free view from the stands but also illuminate the familiar athletics tracks that reflect almost any Egyptian ground lay-out. Opposite the main stand, uncovered seating, equally equipped with horrendous floodlights, and once embraced by the end stands, complete what is now an amputated venue. Regardless of its present state, Helmi Zamora’s spirit will always be on par with the club’s and it’s supporters’ morale. Helmi Zamora’s premises would have physically touched Tersana’s Mit Okba if it hadn’t been for the dual carriageway separating the ground twins in Mohandessin. The blue and white homely Mit Okba hosts Tersana, being the Arabic equivalent for Arsenal. The term ‘arsenal’ connotes was military activities. Tersana were originally founded by those working in the shipbuilding industry in Cairo. Some of those ships might have been built for military purposes and hence the association with the name Arsenal. The blue and white colours are related to marine activity and, voila, also the ship’s anchor in the club’s emblem is accounted for. Interesting of note is that earlier, in the 12th century, the district of Rhoda in Cairo had a major shipbuilding yard, like there was a major shipbuilding yard in Cairo in the Boulaq district in the 18th, 19th and early 20th century. 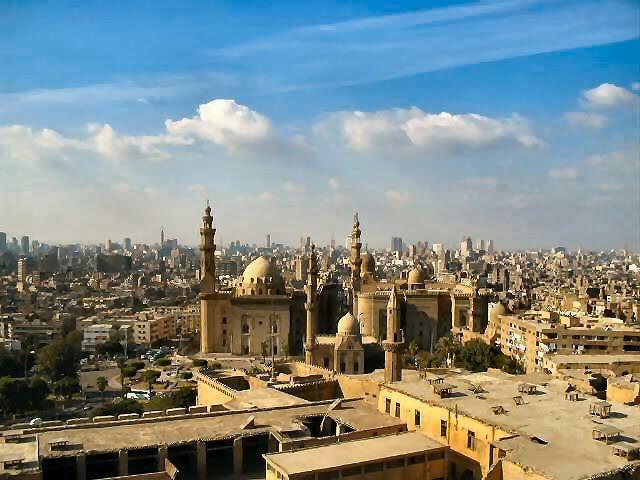 There was also a shipping yard opposite to what is now known as Mahatet Masr, the Egypt's Railway Station in Ramses Square, during the Fatimids era around the 10th century, as the Nile River used to reach this area before changing course by time. Tersana’s nickname is "shawakeesh" which is a slang plural for "shakoosh" or "hammer", so essentially they are nicknamed "The Hammers", which is another connotation to the manual labour of the founders. Mit Okba is set in a carefully nursed botanical dream; a secluded asylum in a colorful arboretum. 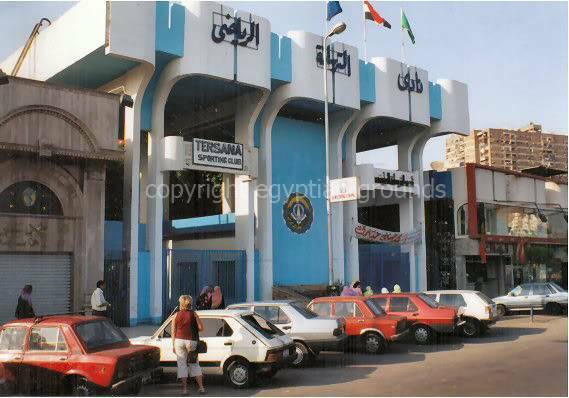 The elevated main stand and its uncovered neighbouring stands in this blue and white heaven are being distinguished from Zamalek’s Helmi Zamora by its modest roof structure and bright blue colours. The only other structure at this venue, holding approximately 10,000, can be found opposite the main stand. Peculiarly enough this ground is void of floodlights and the home team are destined to play away from Mit Okba when they meet other teams for revening kick-offs. Irrespective of the absence of end stands Mit Okba is a delightful small ground, almost idyllic. One intriguing part of the ground has been closed for safety reasons and its this section that calls for a picknick on a lazing sunny afternoon. Please switch your mobile off when entering Mit Okba and appreciate the sound of humming birds, far from the maddening crowd. Mit Okba, the delicate silence of a screaming day. Wadi Degla Investment Company , based in Maadi, Cairo, were established in 2002 as a result of a merger between EgyPro, founded in 1995, and Wadi Degla Group. The invest company earns its name from the nearby protectorate Wadi Degla in Maadi. Wadi Degla (Wadi is Arabic for valley) is a 30km-long canyon that became a national park in 1999. It’s a haven for wildlife — there are desert foxes and gazelles out there. Wadi Degla Sporting Club, owned by the investment company of the same name, is one of Egypt’s most prestigious private sports clubs. It boasts a wide variety of sporting branches such as arching, karate, tennis, squash, swimming, basketball, volleyball, croquet and football. The club incorporated the gazelle from the nearby protectorate in its emblem, whilst the green and yellow accents reflect its habitat. The club’s mission statement is to create competitive athletes, capable of joining the international sports scene. One of their sons tops the world ranking list of squash. In order to accomplish this objective the club management has engaged with some leading internationally world-class recognized sports academies with a proven track of achievements. Wadi Degla holds four sports academies, El Borolossy for squash, Fins for swimming, JC Ferrero for tennis and the Arsenal Soccer School, implementing the most advanced training methodologies with children, as young as six, in 12 different age groups that train with Arsenal certified soccer instructors. 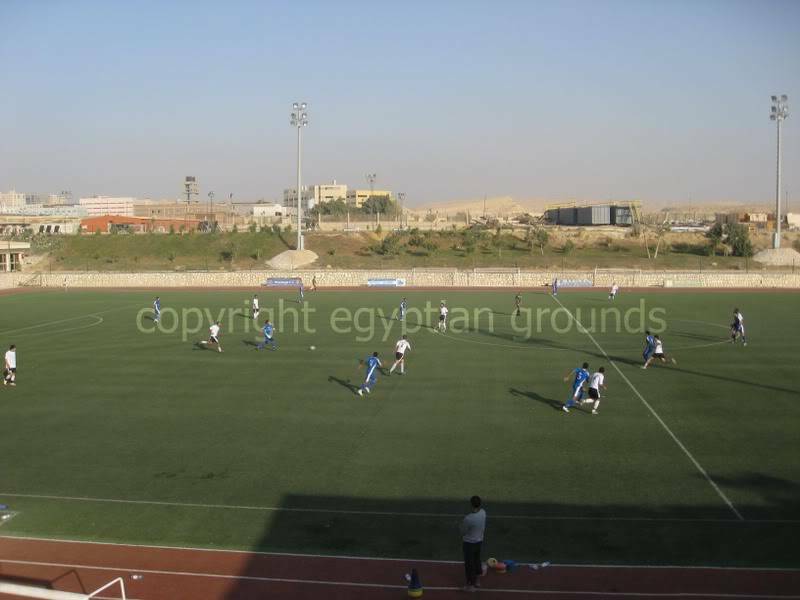 The football ground, set in a spectacular sports park on the outskirts of Cairo, is a rectangular affair. However, the designer still managed to squeeze in the most peculiar athletic tracks with 90 degree corners.